There are many art installations in our museums today, which focus on the problems of trash and pollution. Many of these pieces are overtly political but there are also extraordinarily original and beautiful works, such as the large-scale assemblages by Ghanaian sculptor El Anatsui. In villages throughout Africa, poor people in cooperative programs are learning to lift themselves out of poverty by using trash to create useful and lovely everyday objects like bowls, purses, and accessories. Recently I attended a workshop at Springmaid Mountain near Spruce Pine in North Carolina. There were many enjoyable and playful projects around the new fluid acrylics, mediums and “interference” paints. The last project turned out to be the most interesting one for me, as I love collage and love a challenge. With an hour left of class time, our instructor told us to dig through our trash and find anything we thought we could use in a “trash shrine.” Her inspiration had been trips to Mexico where she saw many roadside shrines, often with bright colors and shiny surfaces. Grabbing and slapping together textures, colors, and shapes, painting the glued down design with loose, watery washes, dipping the brush into paints intuitively, and letting them run and mix on the surface, created unexpected success. I have enjoyed making more of these “shrines,” so-called because of the basically cruciform composition, although my trash at home has not yielded the colorful wrappers from candy consumed during the workshop! I find a rigid surface such as wood panel, to be best for collage where one wants to apply pressure to adhere objects. Ampersand makes great panels of all sizes, with different width cradles and different surfaces. I used heavy matte gel to glue, and Golden Liquid Acrylics to paint. So far, I have five “shrines” in series and hope to make more. What to call the series? Someone has suggested “Detrartus,” art from detritus. What do you think? For inspiration and great techniques, look at the two books by Mary Todd Beam, published by North Light. Mary is eighty-six years old now, but she continues to create powerful works using her trademark mixed media style and personal symbolism. 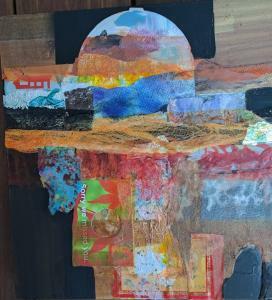 Collage has long been a favorite medium since it allows one to play with all the elements of art in a 2-D space without making an immediate commitment. It also indulges the packrat in me: I have squirreled away letters, cards, menus, tickets and various paper ephemera since I was a young child. At this week long workshop, I met many other people who like me, had collected paper, handmade, printed, stamped, commercial, wrapping, maps, old paper money, postage stamps, antique books and music scores and more over the years. We created collages using our precious papers combined with Xeroxed images of our own photographs, finally embellishing and pulling together our designs with paint and crayon. Our instructor, Maureen Brouillette, started each day with a demonstration of her own technique. She creates strong, contemporary images with a whimsical feel to them. She guided us all gently through the process encouraging individuality and personal styles. At the end of the week I came away with twelve finished collages. It was a marvelous week of intense focus through seven hours each day, with just the midday break for lunch. I barely looked up from my work table during the classroom hours and felt a great sense of satisfaction from the flow of creative energy. 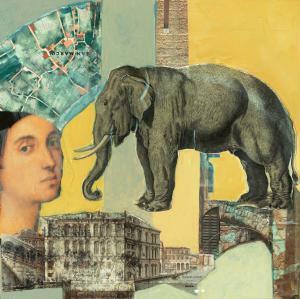 I strongly recommend looking for Maureen's workshops if you enjoy collage and mixed media. Although I have not made any new collages since I have been back, I have again been hoarding my little bits of paper that I know will be the perfect piece in a work some time. I can't wait to get back to the studio!